For decades, ICOM – the International Council of Museums has continued its fight against illicit traffic in cultural goods with the publication of its Red Lists of endangered cultural assets. 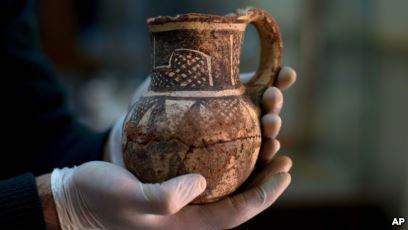 These lists, which are extremely effective reference tools, illustrate endangered categories of archaeological objects and works of art from specific geographic regions that have a greater potential for being traded illegally. Produced as a handy-sized, illustrated poster, each Red List help customs authorities, law enforcement agencies, auction houses, museums, dealers and other parties of the importance identify the general types of archaeological, ethnographic, religious and historic objects likely to be looted from cultural sites, stolen from museums and religious institutions, and subject to illicit trafficking. Afghanistan (2007), Africa (2000), Cambodia (2009), Central America and Mexico (2010), China (2010), Colombia (2010), the Dominican Republic (2013), Egypt (2011), Haiti (2010), Iraq (2003, updated in 2015), Latin America (2003), Libya (2015), Peru (2007), Syria (2013), West Africa (2016) and as of today, Yemen (2018). According to France Desmarais, the creator of the Yemen Red List, "Seven of these Red Lists were classified as "Emergency" Red Lists because they concern countries whose movable heritage had suddenly been placed at risk, either due to a natural disaster (as in the case of the earthquake in Haiti in 2010) or armed conflict (Iraq, Egypt, Syria, Libya, Mali and Yemen)." The Lists are available in English, French, the language(s) of the source country, and as interest requires, languages in countries with a potential for being transit points for illicit trafficking. 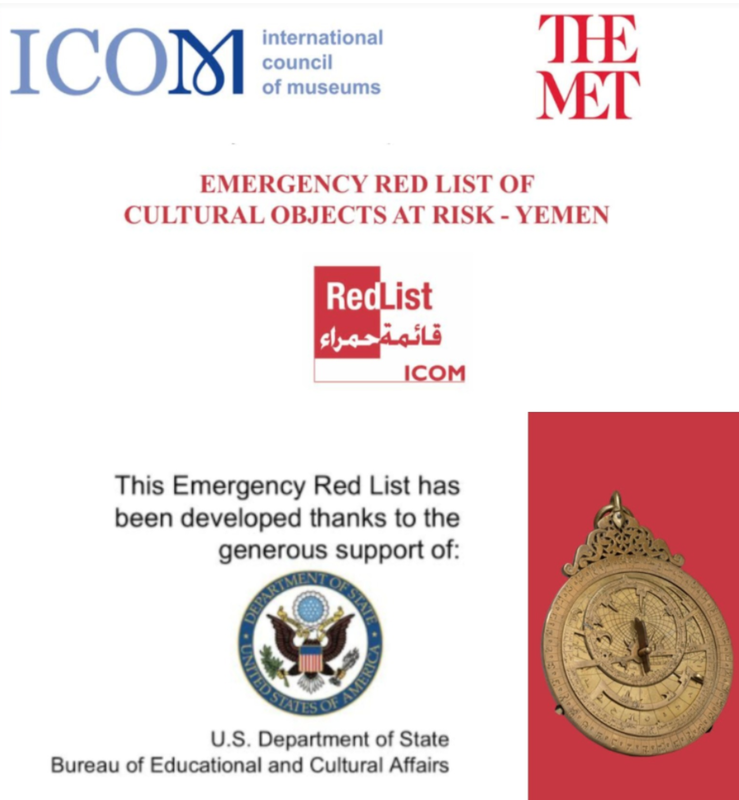 The Emergency Red List of Cultural Objects at Risk – Yemen will be officially presented at the Metropolitan Museum in New York today at 5:00 p.m. 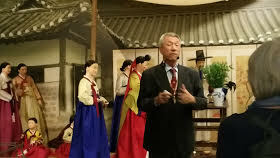 The event will take place in the presence of museum and heritage professionals, government and law enforcement representatives and members of the press. ICOM President Suay Aksoy and Director of Programmes and Partnerships France Desmarais, who developed the Yemen Red List, will officially represent the organisation on this occasion and will introduce the Red List to the Permanent Representative of the Republic of Yemen to the United Nations H.E. Ambassador Khaled Hussein Alyemany as well as to other attendees. Daniel H. Weiss, President and Chief Executive Officer of The Metropolitan Museum will speak on behalf of the Met’s continued support of ICOM’s mission promote awareness on the categories of objects most at risk of being illicitly trafficked. The Emergency Red List of Cultural Objects at Risk – Yemen is one of several Red Lists which have been produced and distributed by ICOM with the support of the United States Cultural Heritage Center. 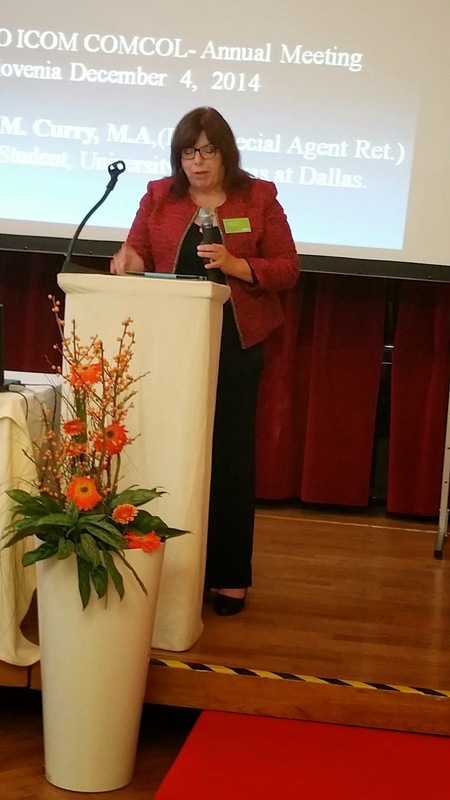 On hand for the event representing the US Government will be Jennifer Zimdahl Galt, Principal Deputy Assistant Secretary for the Bureau of Educational and Cultural Affairs. Produced with the scientific contribution of international experts and museums from Yemen, the United States, France, Italy, the United Kingdom, and Germany, ICOM's new Yemen Red List identifies categories of Yemeni objects which may be in high demand on the art and antiquities market and which are vulnerable to being looted, stolen or illegally exported, especially given the unrest caused by the ongoing conflict. If you are a collector ARCA strongly encourages you to pay close attention to the provenance and legal documentation of any objects you purchase from Yemen, paying special attention to the types of objects which appear on ICOM's Yemen Red List. 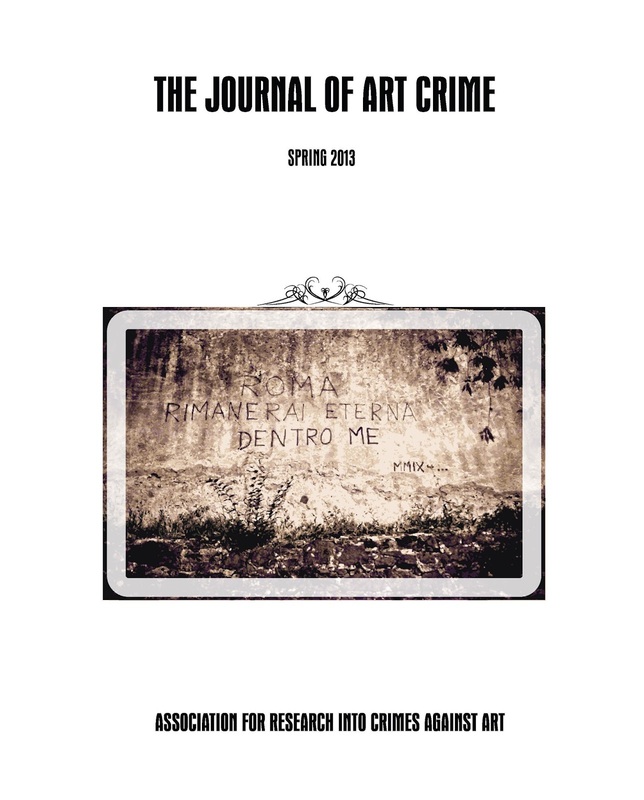 In the column “Lessons from the History of Art Crime” in the Spring 2013 issue of The Journal of Art Crime, Noah Charney discusses the new “Intelligence” body founded by the International Council of Museums (ICOM) to monitor illegal traffic in cultural property. This new group will be called the International Observatory on Illicit Traffic in Cultural Goods. It will work as a bridge between UNESCO, Interpol, and its constituent policing agencies, as well as other research institutions in the field. The “Observatory” is now awaiting formal funding approval from the European Commission. It has long been known that art crime is a funding source for organized crime, from small local gangs to large international syndicates, but the true extent remains uncertain. Until the US Department of Justice recently remade their website, they stated clearly that art crime is the third-highest-grossing criminal trade worldwide, behind only the drug and arms trades, and that it is a major funding source for organized crime and even terrorism (the new website design no longer has a page dedicated to cultural property crimes). Interpol has, in the past, reiterated this information, but currently states that while experts have made such claims, it simply does not have enough information to confirm or deny them. 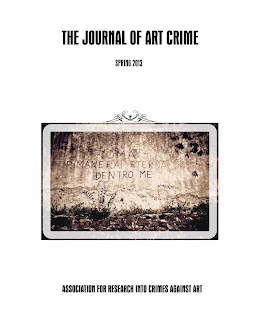 The ninth issue of The Journal of Art Crime, edited by ARCA Founder Noah Charney, is available electronically (pdf) and in print via subscription and Amazon.com. Associate Editor Marc Balcells (ARCA '11) is a Graduate Teaching Fellow at the Department of Political Science, John Jay College of Criminal Justice -- The City University of New York. 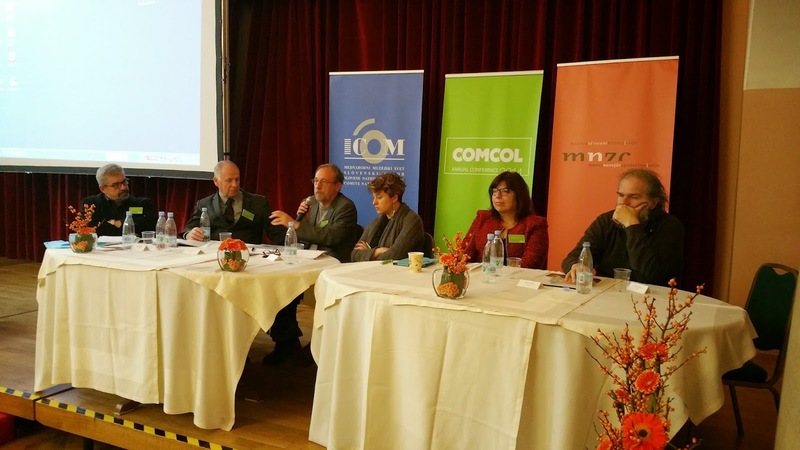 Georges Abungu, Vice President of the International Council of Museums (ICOM) was among delegates participating at Forum d’Avignon, the international think-tank that convenes in the southern French city every year to discuss urgent issues in the realms of culture, media, digital innovation, and economics. London arts journalist Tom Flynn spoke to Dr Abungu about museums, cultural heritage disputes, underwater archaeology, and the role culture should play in the future development of Africa. TF — Dr Abungu, you were one of the few museum specialists who dared to speak out against the ‘Declaration on the Importance and Value of Universal Museums’ issued by the directors of European and North American Encyclopedic Museums and which continues to be a source of controversy as repatriation requests mount. How do you see the future of the Encyclopedic Museum as it is currently being articulated by leading museum directors? GA — I’m very much a believer in museums that are relevant to communities, museums that stimulate curiosity but which also address human needs, that involve communities in the interpretation of their collections. The model I am describing is divorced from the old notion of the temple, it is a museum that is much more open to the public and to questioning; it is a place the curator is not the holder of all the answers. Now when you talk about Universal Museums, I have no problem with museum directors branding their museums in whatever way they wish, but I felt that the whole concept of the Universal Museum as it was being revived was not in good faith. One of the intentions of the Declaration seemed to be to try and do away with the discussions on the role of these collections, the positions of these collections, on the ownership of these collections. So the driving force behind that [Declaration] was to do away with questions that were emerging by branding themselves as universal and above questioning. I think the intention was not good, and that’s why I questioned it. And what about the other museums? What are they? I can give some examples of equally big museums that had big collections that were probably matching these Universal ones. Why weren’t they not also universal? Why were we trying to grade ourselves into different pedigrees? I thought it was going to bring divisions between museums where some are going to be more important than others. The word universal in this context struck a very bad kind of intention when I heard it and that was why I was against it. I think the British Museum, the Metropolitan Museum, the Louvre, and all these big museums, they have a real role to play. They are wonders of the world and they have collections that apply to humanity but I think there is no need to try to grade themselves as much more superior than others and to degrade the others as not so important or as universal as them. So that was an important principle — it was questioning the intention and to me it was this hidden agenda that struck me very strongly. Museums are places of dialogue, places of questions, and some of this dialogue can involve furious discussion, even on origins and acquisition policies and even on thefts, and collections that might have suspect origins and I think this is part of the richness of museums. I’ve seen this taking place. There have been returns, there have been museums that originally had collections that were questioned but some of these collections had been given by the source communities to these museums on the condition that originally they belonged to these communities and that they are now given on permanent loans or that they are given as gifts. To me that is the way forward rather than re-branding and segregating. TF — Today, the requests by smaller nations and source communities for repatriation of objects are often criticised by some leading museum directors as a form of nationalism, on the grounds that all cultures are essentially hybrid and “mongrel” and that those calling for return are failing to understand the cosmopolitan nature of culture. What is your response to that? GA — Well, I’ve heard that argument and I’ve written about returns and I’m one person who doesn’t believe in mass returns. I don’t think it makes sense, especially for collections that have been in these museums for hundreds of years. Unless they are human remains. In those cases I really have no short cut. I think if the source communities want them back, they should go back. 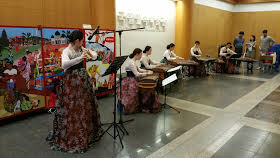 But I believe that we should not shut doors and claim that these cultural objects are cosmopolitan. They must have origins and if those origins can be traced they must be returned to those places. There are materials, of course, that have origins in Britain, others that have origins in the USA, or in Germany, or in France, and if they can prove that, why not ask for them? I think the same applies to other parts of the world, to Asia, to the Pacific, to Australia, Africa, South America. The most important thing is not to hide behind terminologies...the whole concept of urbanism, metropolitanism, and all these things. The important thing is to sit down and create dialogue with those who are claiming, and not to take cover under the big name of Universality and then say ‘There are no more questions, we cannot discuss’. However, I also believe this issue of calling for mass repatriation of materials from museums taken from one place or another many years ago is also irresponsible. I’ve always been very categorical when it comes to the solutions. 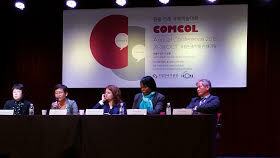 I think we need negotiation and ICOM has set up a structure where people can negotiate and agree. I personally believe very much in permanent loaning but I also believe that museums that have these collections, where there are have arguments about them, or claims behind them, they need to sit down and negotiate without dismissing these claims as cosmopolitan, as cross-cultural, and that they cannot be discussed. They need to engage in dialogue so that discussion can prevail at the end of the day. But as I’ve also said, I don’t believe in mass transfer of material from museums back to source communities just because they can show it was theirs... unless it is human remains. With that one it becomes very tricky. And also certain religious paraphernalia that can be proved to be still relevant to those particular communities. Dr. Flynn is a lecturer at ARCA and author of The Universal Museum. Part two of this article will be published tomorrow.